SouthCarolinaPilot wrote: I think everyone is making some fair points but let's keep it civil. We are all on the same side after all. Yes, the cmments aimed at DD seemed a little harsh as his views are very similar to the views of the majority of UP students I associate with who also consider GU to be their primary rival in sports and academics. For several years now the majority of UP students have come from Washington, followed by Oregon and California, so it is only natural for many of us to consider GU THE rival, as DD pointed out. I would also say that most of us were admitted by both UP and GU, but because we chose UP, our choice of who we root for and against is clear. Watching basketball is not a high priority for most UP students, but for the GU game only, many more students get excited and want to get tickets (not everyone can) and participate in the pre and post game partying. It is understandable that many older GU and UP fans (especially non-alums) do not consider their respective school to be the biggest basketball rivals because of the disparity of play and talent, but if you were to read and hear some of the good natured trash-talking that goes on between current students and recent alums from the two schools, you might conclude the old time UP/GU rivalry is alive and well. Happy Fourth to all Pilots! I think the discussion, kind of like beauty in the eye of the beholder, has shown that rivalries tend to come and go throughout sports and seasons. Those of us who have invested 50+ years in following the Pilots do remember a natural rivalry with Gonzaga: Portland v. Spokane, Oregon v. Washington, CSC v. Jesuits, etc. A mention was made along the way of Seattle U, which was definitely a 50's-60's rivalry. 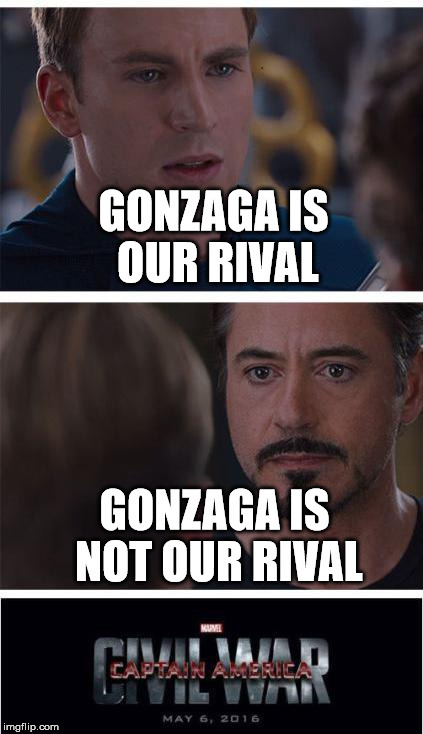 Younger posters don't feel the same way about GU as a rival, primarily because GU owns us (and the rest of the WCAC) at the moment...a number of moments actually. The mention made of St. Mary's as GU's rival is really a recent phenomenon...not true at all a few years ago. So age plays a big factor as well. I honestly have trouble seeing Portland State as UP's major rival in almost any respect, but if it seems that way to younger fans, so be it. The bottom line is supporting the Pilots whenever they compete and whoever they play. I think all the PilotNation posters agree to that. Alright. It's posted now on Reddit. I have to work out some of the formatting issues (spacing, bullets, and some of the flairs), but it's up there and it might as well be the best compilation of Pilot Basketball History out there aside from the History and Records Book on portlandpilots.com: Reddit wiki. Fun fact: only us, Gonzaga, and Pepperdine have wikis so far out of the WCC schools! Both teams played our cross-town rival, Portland State, earlier in the pre-season without much fanfare....sad!